Every month I teach a Lori Smith class at the LQS. And in true Dawn form I didn't make this month's sample until this weekend for tonight's class! But I got it made and quilted! And I like it, even considering I normally don't do things in pastels! Very springy! But it didn't stop there. I had some left over pieces - so I made these 2 small quilts. But wait - I still had some leftovers - so this small quilt got made. And even more scraps so I made this cute little mini. And then I used my crumbs. And the last of my little crumbs! Last 3 blocks for this week - and 2 mistakes! Here are the last 3 blocks for this week! And my mind must have been somewhere else! The flag/star block is actually easy to piece, but for some reason my flying geese were all screwy and the whole thing is just "wonky"! I'll probably do this one over sometime. The real mistake is the gold and blue one. The square in the middle is suppose to be bigger and the gold part thinner. Well I have no idea what I did, but somehow I cut a smaller center square, but had triangles sewn on large enough to still give me the correct size inside square. I love the way it looks with the mistake so this one is staying this way! And I love the crazy reproduction fabric I had for the third block! Tomorrow I"m off to go visit my oldest daughter at college with Emily and we have tickets to see "Annie"! Should be a lot of fun, although a LOT of driving in one day. I won't be back until the wee hours of Monday morning, so won't be back for a few days. But don't forget - post #500 is soon to happen - and the big 500 giveaway! 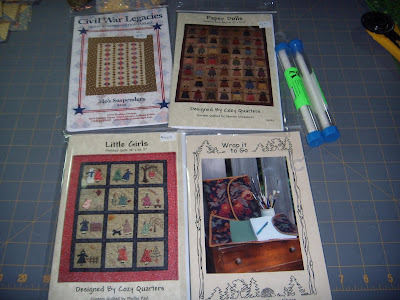 Here are 3 more blocks for this weeks Civil War quilt. They are all turning out so fun! And here is one of my night TV viewing projects! I just started it, so I have a long way to go yet. But I"m using Tracey's back-basting method - I really like it! And here is one other very long term project. I started quilting this last year, but it has been put away for about a year now, so it is time to get it back out and worked on. I only have about 1/3 of it done, but I"m quilting it fairly heavy and love it so far. I don't get hand work done too fast, but someday it will be finished! We had a visitor today in our back yard! Look who came to visit today in our back yard! Wiley (E. Coyote)! He has been hanging around for a few months now, but usually at dusk or dawn so I can't get a picture. So today when it was mid-morning and I was working from home I grabbed a few shots. Of course by the time I ran to get the camera and came back he had moved farther away - probably was from Chloe barking hysterically wanting to go out and play! I also got my last week 1 block done, and my first week 2 block! Oh it was such a good weekend. I did so much sewing! But for today I"m sharing 2 more Civil War blocks I got done! Only one more to go to catch up from last week, and then it is on to this week! Oh and if your interested in what these blocks are, I"ve created a link to a pdf file of the list of blocks we are doing. This is just a suggested list, you can make whatever blocks you want. 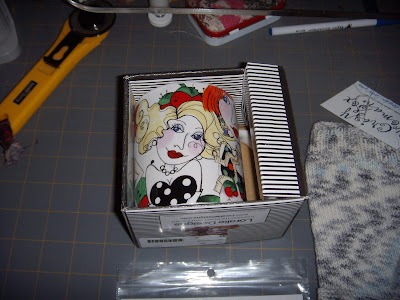 You'll find the link under the Sew Many Blocks blog ring box on my sidebar. I didn't get a chance to take pics of all the fun I had this weekend, so you'll just have to wait - and now that it is the work week again of course I get so busy! BUT - look at what I did get done yesterday! I LOVE spiral binding my books that I use open for long periods of time! I can easily lay them open, or fold them back to make it take up smaller space. And these 2 books were the perfect books for binding this way! I'm so happy I had time to get it done! If your interested in getting any books done like this, I have them done at Office Max. I take it to their copy center and they cut off the binding and then punch the holes and spiral bind them. I have a lot of books I use done like this. To get both books done the bill came to just under $7. So it isn't a big expense either, and so worth it! 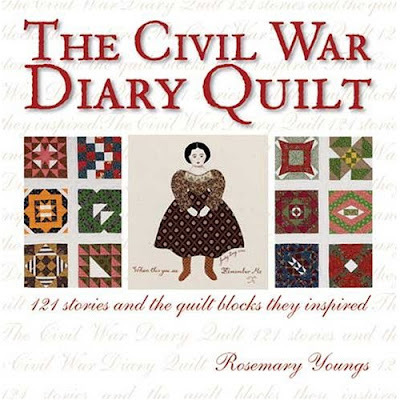 I"ve been wanting to make the blocks from the Civil War Diaries and Civil War Love Letter books for a long time. So when Kathie asked me if I wanted to do it of course I said yes! I"m about a week behind, but I got the first 4 done! (Thank you Kathie for picking easy ones for the first week so I could catch up!). So just a short post today - I'm busy sewing! So I did some early birthday shopping in Green Bay. I mean, geez - I wasn't going back up there in 2 weeks for my real birthday! Although that shop was great so I really could have! So here is what I picked up. I went not expecting too much so I had left my list of fabrics and how much at home. So I did the small kit thing! First I got some fun patterns and some white chalk marking sticks that remove with the iron, they said they worked really well, so I figured I'd give them a try! 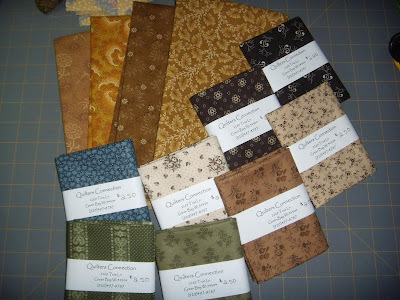 And then some spring fabrics for a class I teach at a LQS. 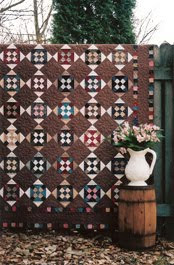 Once a month we do a Lori Smith Small Quilt. I never work in pastels so I wanted to do something totally out of my zone. I"ll have more pics of the quilt later in the week. I"ve already started it. Then I found this adorable baby girl quilt kit. The fabrics on the left will go on the front and the one on the right I got for the backing. It is just a typed pattern so no picture, but I'll be making it in the not to distant future so you'll see it. But isn't that fabric just too cute! 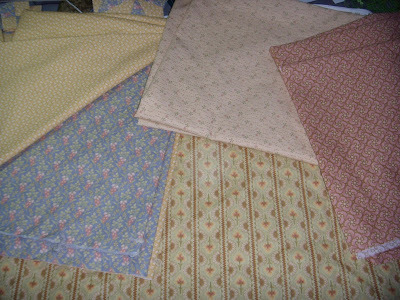 And of course some repro fabrics. In my favorite earth tones. And then some small kits. 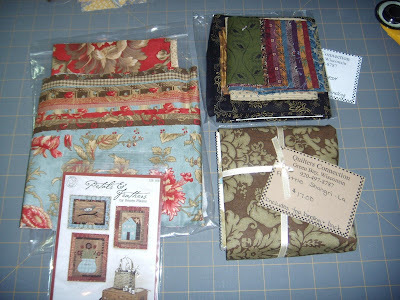 The kit on the left makes all 3 of those little Renee Plains quilts. They are sooo adorable made up. 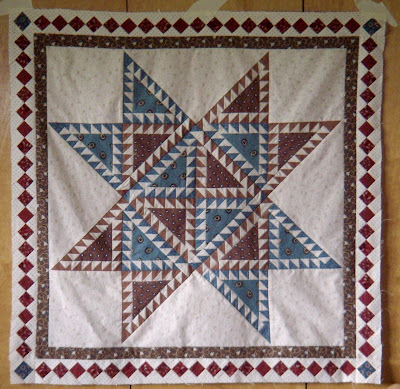 And the one on the top right makes a small churn dash quilt and the one on the bottom makes a Jacobs Ladder type quilt, but the pieces finish very, very small. So that one will be a challenge! So as you can see, I had a wonderful time there! And will be going back! I've been gone for a few days to Green Bay for a work trip. I"m back and hoping to get back to some projects! While there I stayed at a hotel right next to Lambeau Field. And look at the quilt hanging in the hotel! That was a fun surprise. 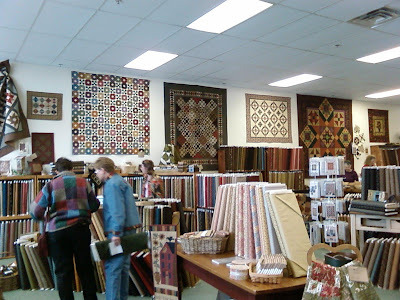 And Melanie from Covered Porches and Wooden Screen Doors told me about a shop she heard about in Green Bay that was suppose to have Reproduction and Folk Art Fabrics. Baby - did they ever! It was wonderful! And right by the hotel and our office! (OK Mark - I know your reading this - yes I did spend some money). 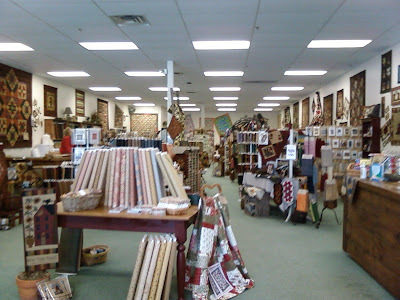 Next time your in Green Bay you have to stop at Quilters Connection. They had all of Carol Hopkins patterns, tons of other fun reproduction type patterns, tons of fun folk art/primitive type patterns and even tons of other fun patterns and kits! 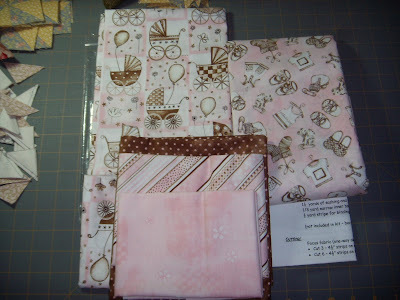 I even got the most adorable baby quilt kit - I'll show that tomorrow - I have 4 baby quilts to make this spring, so it wasn't hard to purchase that! Oh and TONS of reproduction fabrics - I was in heaven! Oh yeah, and wool and stitchery type stuff. Oh and one last tease. Post #500 is coming up in the semi-near future. I bought a bunch of fun things for a give-away there! So keep watching! I got my scrappy trip around the world done! And you know what? It looks pretty darn cool for an ugly fabric quilt! I can't even say it was all made from stash - because the bin the fabric came out of can't even be called stash - it is more like YUCK! 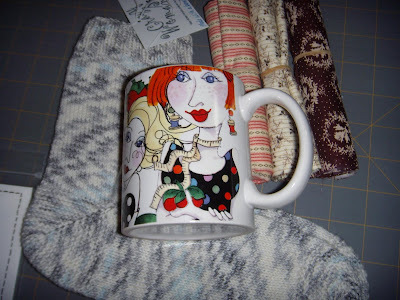 I"m going to make Bonnie's 10-inch block backing (about 1/2 way down the page) too. I have a bit to go on that yet today. (oh and the small brown border is more for anchoring all the pieces when I quilt it. 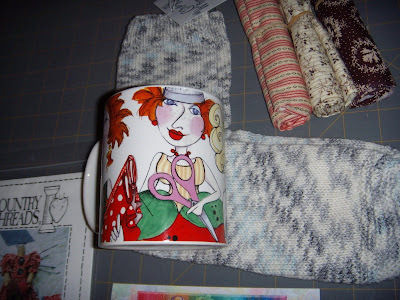 I"m hoping to beg use of a long arm from my friend to get it quilted). Yes, I"m back to Christmas gifts. Our Monday night sewing group exchanged gifts in late Jan and I'm just getting around to sharing one. My friend Julie made this. Is it not awesome! She has become such an awesome machine quilter on these small pieces! And she found that outlining the feather in a different color really adds to the quilting. She made them on silk fabrics and then put them in these beautiful frames. What a great gift they are! I just had to share with you! Since I didn't have time to participate in Bargello Bowl Sunday, and then I saw Marcie's Scrappy Trip Around the World blocks she did - and THEN I got sick so just wanted mindless sewing - I created Bargello Bowl Wednesday - Or Ash Wednesday Bargello - Or Trip to Ash Wednesday! I happily cut up all that old crafty type fabrics, old Jo-Ann fabrics and just misc other cotton fabrics that are UGLY or just strips of good stuff but not big enough to do anything with into 2.5" strips. And started making Bonnie's Scrappy Trip Around the World blocks! It was perfect mindless sewing for a stuffed up big head! And then I took the trimmings from those blocks and started making crumb/chaos blocks for another small charity quilt. I think I did good for not feeling well! 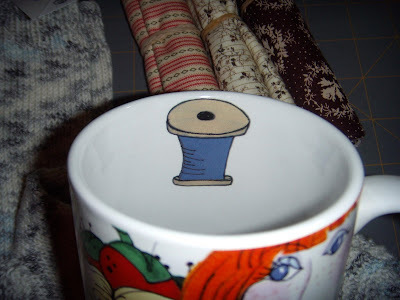 I"ve got a nasty cold - but I saw that Sossy is going to be writing about how to organize your sewing areas the next few days. 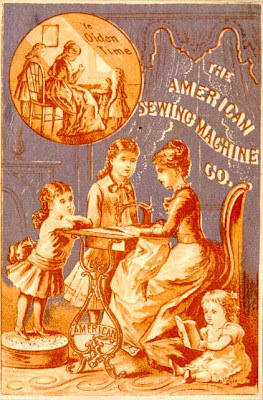 All I can say is I"ve been in her sewing room! 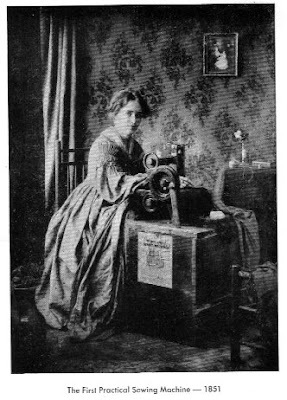 And I"m totally envious of her sewing desk! So I thought you may be interested in what she has to say. So stop on over and learn about Organizing your Sewing Area! Oh Thank You - Paula! Looky, looky, looky what I got today in the mail! My prize from Paula! She was soooo generous and everything is so wonderful! I can't thank her enough! I hope you all go visit her blog and let her know how lovely and nice she is! Is this mug just not the cutest! (I personally can't wait to make the doll)! And aren't the socks so wonderful (Paula made them with bamboo something yarn - is a crazy woman she says)! They are the perfect color for me! 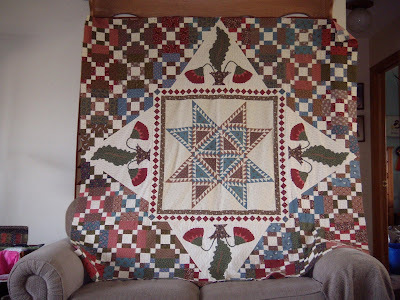 I"ve been working on my medallion quilt now for about a year. I came to a screeching hault when the next round was "Starry, starry night". I had no idea what I wanted to do. 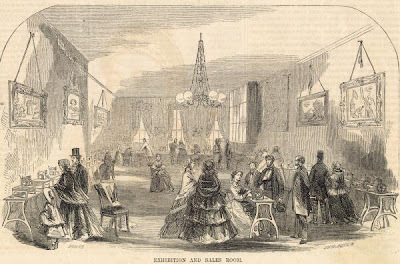 Just regular ohio stars or sawtooth stars just didn't seem to fit. So it sat. And sat. And sat some more. Then during Dec I came across this triangle star in EQ5. This was it! This is what I needed to complete the next round! 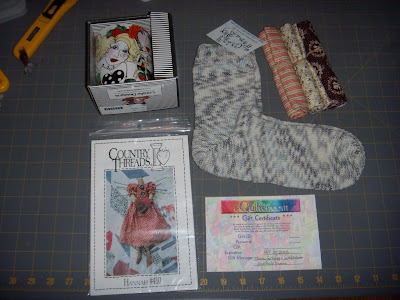 So I had made 4 of them for a block exchange I"m in and they went well so I knew I could make them. I cut out fabric for about 30 blocks (I think I need about 56 stars). I started working on them last weekend at the retreat and they were sooo off. The bottoms were about an inch wider than the tops! They were awful! After ripping and playing with about 3 of them I tossed them all back in my bag and gave up. So this weekend I got them out again and tried once more. I figured out the secret to getting them to come out! Thank goodness! These are coming out a bit smaller than the ones I did at camp but the size doesn't really matter since this is a made up quilt and I am going to put spacers between the stars anyway! So I got 8 done! Now that I know I can get them done ok, I'll start working on the stack of cut fabric! I also finished hand quilting my strippy coin quilt and got the binding on! I"ll hand sew it down tonight and get it washed to get all the chalk lines off. It already is so soft and comfy from hand quilting it! I just love how it turned out!